V-Lock Batteries and Chargers for Sale from Cam-A-Lot Rentals. Here is a list of details and specifications to better understand the differences between the battery models available. Each battery has a build-in D-tap DC Output Socket for powering on-camera lights, monitors, wireless transmitter, etc. Each battery also has a 4-level LED power indicator to check the battery remaining capacity. You can get a quick view of capacity before using. The SC-302S has 2 V-mount plates and can charge 2 batteries one-by-one sequentially. The charging output is DC 14-20V, 1.9A. The SC-302S has LED charging indicators on the front panel, indicates the real time capacity of each channel by different colours when charging. 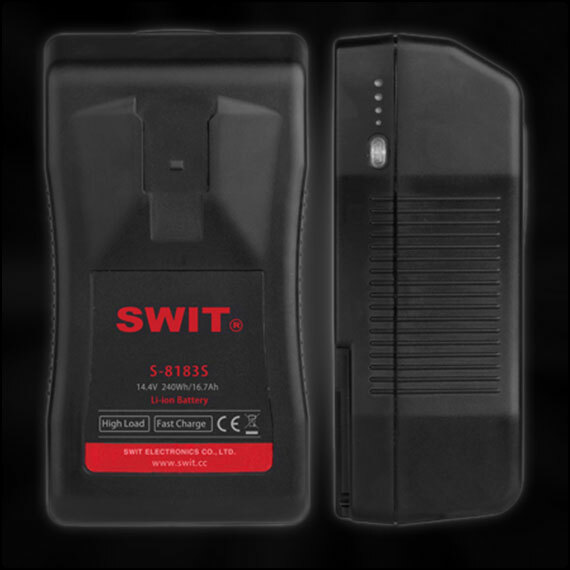 Manufactured by Swit. To view more of our products for sale visit our sales page.